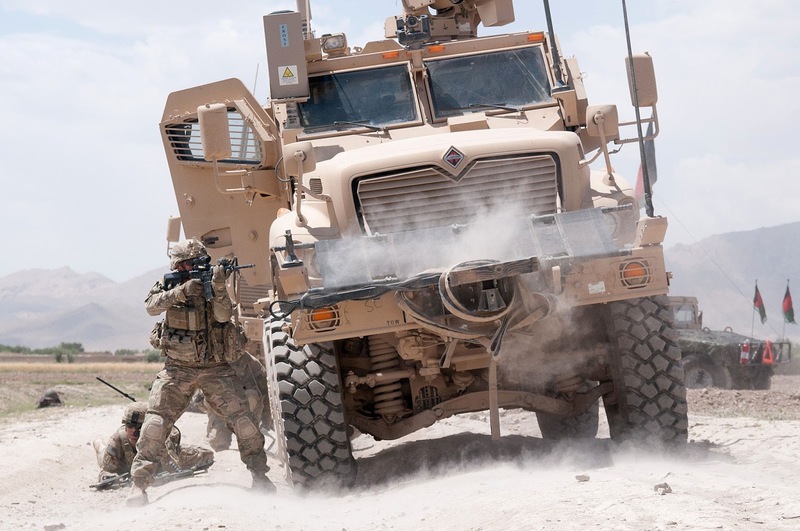 For our fourteenth installment let's take a look at the most common Mine-Resistant Ambush Protected (MRAP) Vehicles of the war in Afghanistan. MRAP is an American term for vehicles that are designed specifically to withstand improvised explosive device (IED) attacks and ambushes. Armored vehicles designed specifically to counter the land mine threat were first used during the Rhodesian Bush War; the technology subsequently matured with the development of the South African-designed Casspir armored fighting vehicle, which inspired the United States MRAP program and was the basis for some of the program's vehicles. 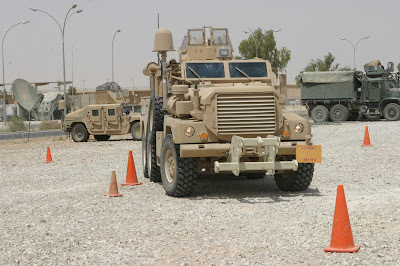 From 2007 until 2012, the Pentagon's MRAP program deployed more than 12,000 MRAPs in the Iraq War and War in Afghanistan. The International MaxxPro MRAP (Mine Resistant Ambush Protected) vehicle is an armored fighting vehicle designed by American company Navistar International's subsidiary Navistar Defense along with the Israeli Plasan Sasa, who designed and manufactures the vehicle's armor. The vehicle was designed to take part in the US Military's Mine Resistant Ambush Protected vehicle program, led by the US Marine Corps, as well as a similar US Army-led Medium Mine Protected Vehicle program. 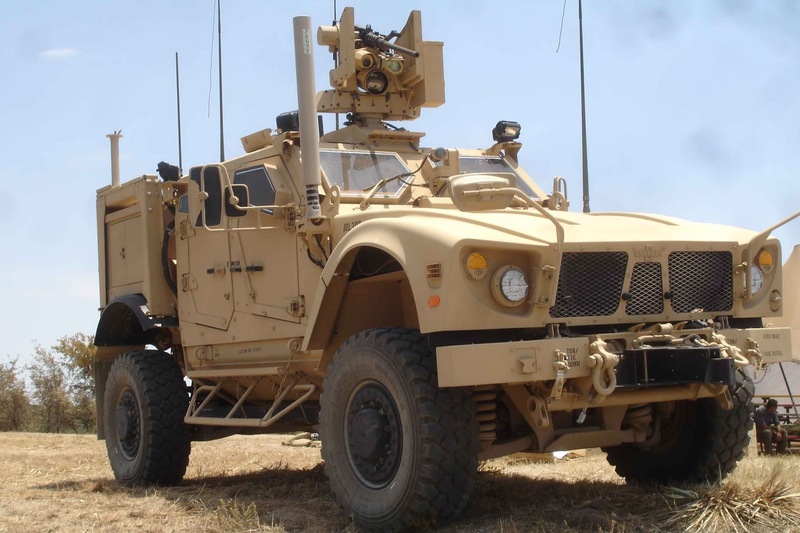 MRAPs are categorized as category 1 or category 2, depending on usage and passenger compartment space, and Navistar produces the MaxxPro in both sizes, although the vast majority of those sold have been category 1 MRAPs. The MaxxPro Plus model comes with dual rear wheels for increased load carrying capacity, such as an ambulance or EFP protected variant. The latest model produced is the MaxxPro Dash, which is a smaller and lighter category 1 model. Both the Plus and Dash models use the MaxxForce 10 engine with 375 hp, in place of the DT 530 with 330 hp, used in the original base model produced. The MaxxPro utilizes a crew capsule with a V-shaped hull, mounted on an International WorkStar 7000 chassis. The V-hull deflects the blast of a land mine or improvised explosive device (IED) away from the vehicle to protect its occupants. Because the chassis is mounted outside the armored crew capsule, there are concerns that it will likely be destroyed in the event of an ambush, leaving the soldiers inside stranded. However, according to Navistar Defense spokesperson Roy Wiley, the MaxxPro "did extremely well during the tests, and we are extremely pleased." This design may prove as effective as the Krauss-Maffei Wegmann ATF Dingo that uses a similar design, one which mounts an armored capsule to a Unimog chassis. This design has survived a 15 lb land mine blast with no injuries. 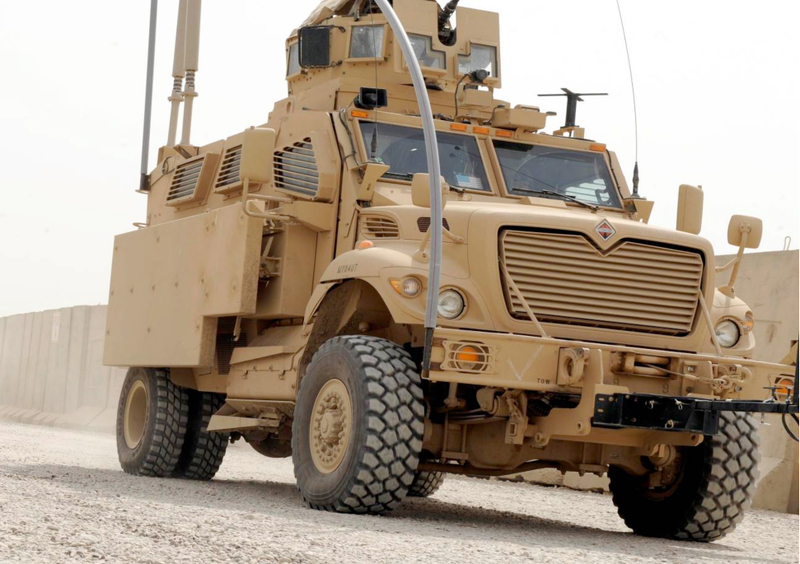 According to Navistar Defense, the vehicle is designed with operational readiness in mind and utilizes standardized, easily available parts, to ensure rapid repair and maintenance. The armored body is bolted together instead of welded, as in other MRAPs. This facilitates repair in the field and is a contributing factor to Navistar's greater production capacity for the MaxxPro. In 2010, the Army initiated a development effort to add electronic stability control (ESC), a computerized technology designed to improve vehicle stability, to the MaxxPro. The MaxxPro's high ground clearance provides greater protection from underbody blasts, but also raises its center of gravity, causing rollovers in certain situations. The ESC combines road factors, vehicle data, and driver intent to automatically correct driving to ensure stability during maneuvers. Installation on MaxxPros began in late 2014 and is to be completed by late 2017, with other MRAPs planned to have ESC integrated onto them. It is a family of armored vehicles produced by Force Protection Inc, which manufactures ballistic and mine-protected vehicles. The vehicles are integrated by Spartan Motors. These vehicles are protected against small arms, land mines and improvised explosive devices (IEDs) using a combination of design features and materials to protect both the crew and engine compartment against a wide range of attacks. A Monocoque type, V-shaped hull extends to the engine bay and serves to direct the blast away from under the vehicle. In 2004, the new Cougar was designed by a small British-led team in the US at Force Protection, Inc., in response to an urgent requirement by the US Marine Corps. This was a new design, developed in the US, based on an evolution of vehicle mine-protection technology used by the South African Army and Rhodesian Security Forces since the 1970s. The very first sketches of the new vehicle were made in late March 2004 in response to those initial USMC inquiries. The rapid development and production that followed was based upon the USMC request that the first vehicle be delivered within 6 months of an order - which was subsequently placed in mid-April 2004 for 27 units. Some 4,000 of these vehicles were fielded under the US military's MRAP (Mine Resistant Ambush Protected) and other vehicle programs. US Defense secretary Robert Gates demanded that the vehicles be ordered in larger numbers after the Marines reported in 2004 that no troops had died in more than 300 IED attacks on Cougars. Since then, Cougar vehicles have been hit by improvised explosive devices (IEDs) many times in Iraq with few fatalities. Britain chose the Cougar over the RG-31 Nyala for their "Mastiff" APV. As of December 2011, the Pentagon planned to add the Crows II remote weapon station and the Frag Kit 6 anti-EFP armor. Official data state, that the Cougar is able to withstand a blast of at least 30 lbs TNT under a wheel and 15 lbs TNT under a belly. The Oshkosh M-ATV is a Mine Resistant Ambush Protected (MRAP) vehicle developed by the Oshkosh Corporation of Oshkosh, Wisconsin for the MRAP All Terrain Vehicle (M-ATV) program. It is designed to provide the same levels of protection as the larger and heavier previous MRAPs but with improved mobility and it is intended to replace M1114 HMMWVs. The M-ATV utilizes the Medium Tactical Vehicle Replacement (MTVR) chassis and TAK-4 suspension with the Plasan designed armored hull developed for the Northrop Grumman/Oshkosh JLTV Technology Development (TD) phase proposal. The V-shaped Plasan armored hull offers protection for the occupants from IED attacks while a central tire inflation system (CTIS) and run-flat inserts allow the M-ATV to travel at least 30 miles at 30 mph even if two tires lose pressure. The vehicle can also take a 7.62 mm round to its engine oil/coolant/hydraulic system and continue to drive for at least one kilometer. The Stat-X engine fire suppression system provides for further survivability. The TAK-4 suspension is coil sprung and fully independent, and offers 16 inches of travel. The M-ATV's roof mounted turret is capable of mounting weapons such as an M240 machine gun, a Mk 19 grenade launcher, an M2 Browning machine gun, a MILAN anti-tank guided missile, or a BGM-71 TOW anti-tank guided missile launcher. The roof weapons can be operated either from the turret by person or remotely inside the cabin with a CROWS remote weapon system. The M-ATV also features modern vehicle safety systems such as traction control and anti-lock brakes in addition to modern creature comforts such as an HVAC system and power outlets for charging portable electronic devices. Unique among MRAP vehicles are the M-ATV's back rear-hinged doors. Husky VMMD (Vehicle Mounted Mine Detector) or, as it was previously known, the Chubby system, is part of a mine-removal system developed by DCD-Dorbyl Rolling Stock Division which are based on the East Rand in Gauteng, South Africa. The system was developed in the 1970s for the South African Defence Force to clear military convoy routes of mines in Namibia and Angola. The VMMD system consists of two Husky vehicles. The first one acts as a Mine Detection Vehicle (MDV). In the past this vehicle was called a Meerkat and wasn't a 4x4. The second Husky in the system tows a set of three Duisendpoots and is known as a towing /mine detection vehicle (T/MDV) The latest version of the Husky, the 2G, has high sensitivity low metal content detectors, ground penetrating radar, powerful air blowers and a robotic arm. This extra equipment has caused the design of Husky to evolve to take a second crew member. The Husky 2G was voted one of the US Army's Top 10 most innovative advances in Army technology. The Duisendpoot is a mine-detonating trailer set (MDT). It will detonate any mines not detected by the Meerkat and Husky. "A rusting Soviet-made BTR-60 armored personnel carrier sits abandoned in the center of a village in Afghanistan's Oruzgan province. Such reminders of Afghanistan's violent past, and present, are commonplace throughout the country. 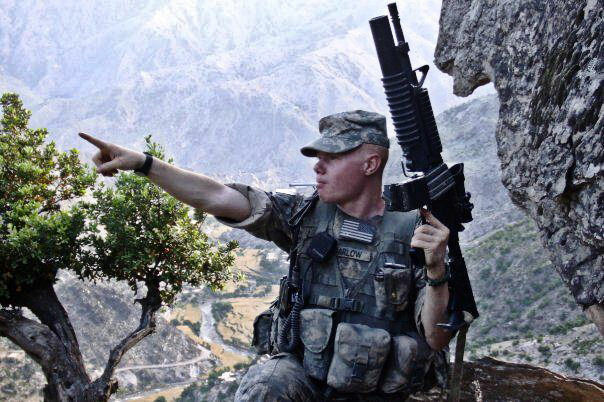 Photo by: Gunnery Sgt. Keith A. Milks"
For our thirteenth installment let's take a look at the most common tanks and armored fighting & reconnaissance vehicles of the war in Afghanistan. While there isn't much recorded of battles between US Forces and Taliban possessing tanks, the Taliban did have an arsenal of tanks, fighting vehicles, and armored personnel carriers during their years of control over Afghanistan and during the raging civil war in Afghanistan at the beginning of the US-led invasion. Though the majority, if not all, were out of the hands of the Taliban by the end of 2001. The BTR-60 is the first vehicle in a series of Soviet eight-wheeled armoured personnel carriers (APCs). It was developed in the late 1950s as a replacement for the BTR-152 and was seen in public for the first time in 1961. BTR stands for Bronetransporter (literally "armoured transporter"). 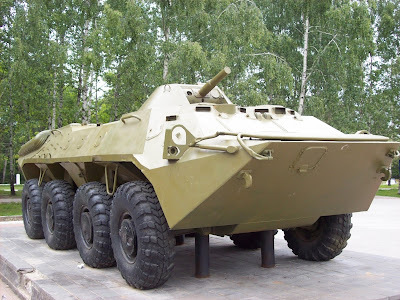 BTR-60 was a revolutionary design for its time. It had a non-standard layout for an APC; the crew compartment was in the front, the troop compartment in the middle and the engine compartment in the rear. This meant that, while the BTR-60 didn't share some of the weaknesses that other APCs had, it had several disadvantages of its own. The BTR-60P can transport up to 16 fully equipped soldiers. This number reduced to 14 in BTR-60PB. As the BTR-60P didn't have a roof, it was covered with a tarpaulin when traveling in bad weather conditions. It was also covered with bows and canvas. Also, all BTR-60 models had three firing ports on each upper side of the hull through which the infantry being transported could fire at the enemy with their personal weapons. The difference between models was in the position of these three firing ports. The BTR-60P and BTR-60PA had the firing ports positioned in a row between the middle and the front part of the troop compartment. In the BTR-60PB, the firing ports were relocated; one was next to the driver and commander, one next to the gunner and one in the side of the troop compartment. Because of the engine placement (in the rear of the vehicle), transported infantry must mount and dismount through the sides in the BTR-60P or through the roof hatches in the roofed BTR-60PA, BTR-60PB, and BTR-60PZ variants. The hull armour is made from welded steel and provides protection against small arms fire and shrapnel. The frontal armour can withstand 7.62 mm bullets from any range. The rest of the armour can withstand 7.62 mm bullets from a range of 100 m.
The BTR-60P did not have a roof over the troop compartment, which made a weakness that could easily be exploited - even the simplest explosives could take out a BTR-60P. The new BTR design with a roof was called the BTR-60PA. The BTR-60 is fully amphibious, propelled in the water by a jet centrally mounted at the rear of the hull. It was, however, prone to breakdowns. When not in use, it is protected by the sideways opening lids. Before entering the water, the trim vane at the front of the hull should be erected to prevent water from flooding over the bow. While in its traveling position, it serves as additional lower frontal armor. The BTR-60PB was used in large numbers during the initial part of the Soviet War in Afghanistan. This was because the units that were originally used for this operation weren't the top priority of the Soviet military, which prioritized the units stationed in East Germany. The same design flaws were present during this conflict and the vehicle became even more vulnerable due to the kind of fighting that took place in Afghanistan. The GAZ-40P gasoline engines experienced frequent power losses and overheating due to the tropical highland climate for which they were not well suited. Also, the BTR-60PB's turret could not elevate its armament high enough to fire at the Mujahideen attacking from high ground. Like during the Sino-Soviet border conflict, many BTR-60PBs fell victim to RPGs. Because of those drawbacks, the BTR-60PBs were replaced by BTR-70s as soon as possible to a point were only the BTR-60 command variants were used. The BRDM-2 is an amphibious armored patrol car used by Russia and the former Soviet Union. It was also known under the designations BTR-40PB, BTR-40P-2 and GAZ 41-08. This vehicle, like many other Soviet designs, has been exported extensively and is in use in at least 38 countries. It was intended to replace the earlier BRDM-1, compared to which it had improved amphibious capabilities and better armament. The armament is the same as the BTR-60PB armoured personnel carrier; a 14.5 mm KPVT heavy machine gun with a coaxial 7.62 mm PKT general-purpose machine gun as a secondary weapon, both in a small conical BPU-1 turret mounted on the hull in a central position above the belly wheels. The 14.5 mm KPVT heavy machine gun has a practical rate of fire of 150 rounds per minute and a cyclic rate of fire of 600 rounds per minute. It has an effective range during daylight operations of 2,000 m. It can penetrate 20 mm of armour at a range of 1,000 m and 30 mm of armour at a range of 500 m. It can also fire at air targets, in which case the tactical range is 1,400 m. It uses the 14.5 mm API-T, 14.5 mm I-T, 14.5 mm HE-T, 14.5 mm and MDZ type ammunition. The 7.62 mm PKT coaxial general-purpose machine gun has an effective range during day time operations of 1,000 m while the vehicle is stationary and from 400 m to 500 m while the vehicle is on the move. It is fired in 2 to 10 round bursts and has a practical rate of fire of 250 rounds per minute and a cyclic rate of fire of 650 rounds per minute. During daylight operations, the gunner uses the PP-61AM sight, which has a field of view of 23 degrees and x2.6 magnification. The BPU-1 turret is unusual because it has no top hatch opening. Contrary to the popular belief, the BPU-1 turret was originally designed for the BRDM-2. The turret was later used in the Soviet BTR-60PB, the Polish SKOT-2A and the Czechoslovak OT-64A. The turret allows the armament to be elevated between −5 and +30 degrees. On the left side of the turret, there is an air inlet on the hull top. There are also two air-inlet louvers in the forward part of the engine compartment's roof and four smaller air-inlet louvers to the rear. Both sides have centrally placed vision blocks. The vehicle armor, which is composed of welded steel, protects it fully against small arms fire and small shell fragments; but doesn't protect it against big artillery fragments or .50 caliber machine gun fire, which can penetrate the BRDM-2's maximum armor of 14 mm. The BRDM-2-series tires are not protected by armor and are particularly vulnerable to puncture from fire of all kinds. There are three different production lots, which have different cooling vents on the engine deck. The late production version has mushroom-type vents. It also has slightly modified turret and can elevate its armament to +60 degrees. Final production BRDM-2s have additional turret periscopes and a TNA-2 navigation apparatus. 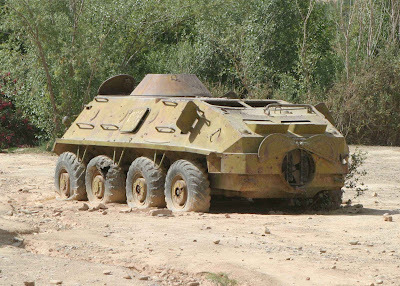 When the soviet forces left Afghanistan, they abandoned many BRDM-2s. These vehicles, together with some derelict ones restored back to working state, are now used by the Afghan National Army. The BTR-70 is an eight-wheeled armored personnel carrier originally developed during the late 1960s under the industrial designator GAZ-4905. On August 21, 1972, it was accepted into service and would later be exported to the Warsaw Pact and other allies. Introduced as a successor to the earlier BTR-60, it most closely resembles a BTR-60PB. Improvements include heavier armor plating and tires less prone to puncture. In other respects, the vehicle is very similar to the BTR-60PB, both vehicles having a roof-mounted turret equipped with a heavy machine gun and a secondary co-axial PKT machine gun, but with a more powerful petrol engine configuration. 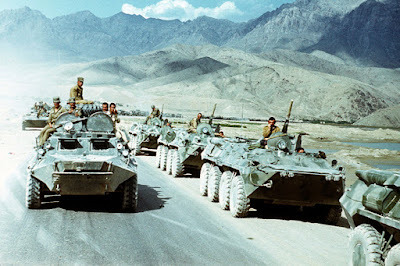 The BTR-70 was widely used during the Soviet war in Afghanistan and many smaller conflicts in Eastern Europe. The BTR-80 is an 8x8 wheeled amphibious armored personnel carrier (APC) designed in the USSR. It was adopted in 1986 and replaced the previous vehicles, the BTR-60 and BTR-70, in the Soviet Army. It was first deployed during the Soviet war in Afghanistan. The Soviets based the BTR-80 on the BTR-70 APC. It has a single 260-hp, V-8 turbocharged, water-cooled, diesel engine, an improvement over the twin gasoline engines installed in the BTR-60 and BTR-70 vehicles. The reconfigured rear portion of the hull accommodates the new, single engine. The Soviets removed the roof chamfers of the modified BTR-70, raised the rear, and squared off the rearward-sloping engine compartment. Standard equipment includes TNPO vision blocks, TNP-B and TKN-3 optical devices for the driver and commander, an OU-3GA2M infra-red search light, six 81 mm smoke grenade launchers 902V "Tucha", a radioset (R-173 or R-163-50U), an intercom, and hydrojets for amphibious propulsion. The Soviets modified the truncated cone turret used on the BTR-70 for the BTR-80 by redesigning the mantlet. This allows the 14.5 mm KPVT and coaxial 7.62 mm PKT machine guns to be elevated to a maximum of 60 degrees. This high angle of fire is useful in engaging targets on steep slopes, in urban fighting, and for engaging low slow flying air targets. The Soviets have also modified the design and positioning of the firing ports; the ports are now round, rather than tear-shaped, and have ball mounts similar to those used on the BMP-1. The forward firing ports now sit in angled recesses, which allows infantry to fire from the front of the vehicle. The redesigned side doors are split horizontally. The upper portion opens forward; this gives dismounting troops some protection against small arms fire from the front of the vehicle. The lower portion opens down, forming a step. Six smoke grenade projectors are mounted on the rear of the turret. The BTR-80 can climb a slope with up to 60% gradient and climb a vertical step of 0.5 m.
The Soviets have retrofitted some BTR-70s with several of the improvements incorporated into the BTR-80, including the high-angle-of-fire turret. The twin doors are designed to allow the infantry to disembark while the vehicle is in motion, and allow the infantry inside to exit from one side if the other is receiving fire. The 30mm Cannon variants are effective against most targets apart from main battle tanks, against which they can still cause significant damage to optics, weapons, and important systems. The main gun is not stabilized, so accurate fire on the move is limited to low speeds, and the turret's rotation mechanism is manually operated. The gunner sits in a roof-mounted chair located above the flat floor behind the driver/commander and two passengers, and before the passenger bench. The gunner's station is basic, but uncharacteristically spacious for a Soviet armored vehicle. The gunner is equipped with both a day time optical sight and an infrared night sight.